This could be the most important question asked when preparing for your Carnival cruise. “Do I buy cruise insurance from Carnival or from a 3rd party?” Luckily, there’s a clear winner. Most agree that Cruise Insurance is a must. According to a recent survey, 66% of passengers buy cruise insurance. We’ll assume that you’re sailing Carnival and have already decided to insure your vacation. When booking with an agent or on Carnival’s site, both make it incredibly easy to buy cruise insurance from Carnival. This is by far the easiest way to buy cruise insurance for your Carnival cruise. But, it’s also the worst way to get coverage. Here we offer a bunch of reasons why it’s a terrible idea to buy direct from the cruise line – Never Buy Cruise Insurance from the Cruise Line. Included in that post we show why it’s inefficient, at best, and corrupt, at worst (including recent law suits). However, in this post we’ll only focus on the most important pieces of cruise insurance; Carnival’s Cost and Coverage compared to a 3rd party alternative. 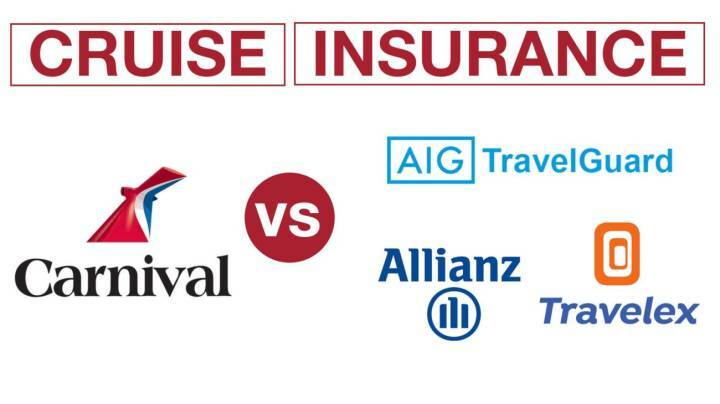 We compared the coverage provided by Carnival to the three leading cruise insurance providers out there (Allianz, Travel Guard, and Travelex). Based on this comparison, we assigned a letter grade to the Cruise Insurance offered by Carnival. We broke down Carnival’s Insurance Policy by each major item, including the following. Carnival will reimburse up to $10,000 if you need medical help after injuring yourself while on your trip. You must receive initial treatment while on vacation and all further treatment must occur within 52 weeks of the date of the accident. The following items are included in your cruise insurance coverage with Carnival. We give Carnival an F for their Medical Coverage. At just $10,000, the company is leaving you very exposed to risk. Most people consider this and the “evacuation coverage” as the most important pieces to their policy. Medical Accidents are the scariest and potentially costliest risks we have when traveling. We’ve heard many horror stories including heart attacks, excursion mishaps, unexpected illness, etc. Expenses add up quickly while on a ship or in a foreign port. We advise no less than $50,000 in Medical Coverage. At just $10,000, Carnival is far short of this recommendation. We’d never consider cruise insurance from Carnival for this reason alone. Carnival will pay up to $30,000 if an accident or sickness requires medical evacuation during your cruise. The emergency evacuation must be ordered by a physician. You can’t be like, “hey, I’m outta here.” Doctor’s orders only. What does Emergency Evacuation mean? Your medical condition requires transportation to the nearest Hospital where appropriate medical treatment can be obtained. If they can fix you up while on the ship, then you’ll stay on the ship. Transportation of Dependent Children: If You are in the Hospital for more than two (2) days following a covered Emergency Evacuation, the Company will return Your unattended Dependent Children accompanying You on the scheduled Trip, to their home, with an attendant if necessary. Transportation to Join You: If You are traveling alone and are in a Hospital alone for more than seven (7) consecutive days, upon request the Company will bring a person, chosen by you, for a single visit to and from your bedside. We give Carnival an F for their Emergency Evacuation Coverage. At just $30,000, the company is leaving you very exposed to risk. Most people consider this and the “medical coverage” as the most important pieces to their policy. While rare, a medical evacuation isn’t completely unheard of. For those that cruise often, you’ve likely seen the Medical Helicopter pick someone up from the ship. The associated expenses can escalate to the hundreds of thousands of dollars!. We advise no less than $250,000 in Emergency Evacuation Coverage. At just $30,000, Carnival is well short of this recommendation. The other three providers offer more than 16x the coverage as the cruise insurance from Carnival. What does cruise cancellation insurance cover? Your cancellation insurance will cover the following according to Carnival’s policy. Carnival offers up to 100% of your trip cost in the case you have to cancel for one of the reasons noted above. We give Carnival a B+ for their coverage. Some insurance providers offer the ability to upgrade to allow for a payout exceeding 100% of costs. While Carnival doesn’t offer this, the company does offer the ability to cancel for any reason. Even if forced to cancel for a reason not listed above, you’ll recover 75% of your cost in the form of Carnival credit to use on a future purchase. What is included in my Vacation Interruption coverage? Your vacation interruption coverage includes the following according to Carnival’s insurance policy. In any of these cases, you’ll be reimbursed for all associated losses including hotel, airfare, shore excursions, incidentals, etc. Carnival offers up to 100% of your trip cost in the case that you’re interrupted for one of the reasons noted above. We give Carnival a B+ for their coverage. Some insurance providers offer the ability to upgrade to allow for a payout exceeding 100% of costs. With cruise insurance from Carnival, you’ll get reimbursed up to $500 if your trip is delayed for more than 3 hours. It’s great that the company requires only 3 hours before considering you “delayed,” but unfortunately doesn’t compensate you well enough if this is the case. Carnival offers up to $500 in the case that your trip is delayed. When compared to all other cruise insurance providers, Carnival falls last on the list. If your luggage is lost during your vacation, Carnival will compensate you more than any of the 3rd-party insurance providers. You’ll receive a maximum of $1,500 in any of the following circumstances. Carnival offers up to $1,500 in the case that your bags are lost, stolen or damaged. When compared to all other cruise insurance providers, Carnival comes in 50% higher, which we consider significant. If your luggage is delayed for greater than 24 hours, Carnival will compensate you up to $500. During the period in which your stuff is lost, you may need the following. I’m sure you can think of more. These items will be covered by Carnival or other providers to make sure that you’re all set until your stuff does arrive. Carnival offers up to $500 in the case that your bags are delayed. While this is more than the other providers, the cruise line makes you wait longer to receive compensation. Your bags must be lost for more than 24 hours vs the requirement of 12+ hours for TravelGuard and Travelex. As you can see from our analysis above, cruise insurance from Carnival will provide significantly less coverage for medical care and slightly better coverage for your luggage. Unless you’re traveling with the family jewels, your luggage risk is capped. However, your medical risk is virtually unlimited. Accidents can cost hundreds of thousands of dollars. You’re probably wondering, “is Carnival Insurance cheaper than 3rd Party Coverage?” You’d assume it would be much cheaper given the limited coverage. But, this isn’t the case! We took quotes from Carnival and compared them to the three most prominent cruise insurance providers in the industry. In every scenario, Cruise Insurance from Carnival was significantly more expensive. Often by 40% when compared to the cheapest alternative. And again, this alternative showing much better overall coverage. Here’s one example showing Carnival’s cost vs the alternative. NOTE: In this case, we’d only choose Carnival’s policy if there was a high likelihood that we would cancel the cruise. Also, we’d need not to be worried about Medical issues if Choosing Carnival Cruise Insurance. If we’re not planning to cancel or want decent medical coverage, this plan is far worse than all others. In our “Coverage” section, we analyze the other three providers to determine which is best based on specific risk factors (cancellation, medical issues, baggage loss, etc). To reinforce our message – you will pay more for worse coverage if buying directly from Carnival Cruise Line. We advise that you only purchase through 3rd party providers (those listed above are great options). “Insurance” is one of the most confusing topics for those booking a cruise vacation. Please help us share this post to clear up some of the confusion!